Capsule Summary: Everyone at the 4077th has to get a physical exam which brings to light Trapper’s ulcer–and his ticket home. Poor Trapper. I’m surprised he got so excited about going home due to an ulcer. After all, he was the only one skeptical of the cease-fire back in Season 1. Maybe he was just too thrilled about seeing his wife and daughters again to think rationally. It’s a little strange that he didn’t realize earlier having an ulcer could be his ticket home. Hawkeye realized it immediately. Even Radar seemed to know what an ulcer meant. How could they all be so wrong? Hawkeye, Trapper, Henry, and Radar were all convinced the Army would send Trapper home because of the ulcer. It’s not like the Army changed its regulations. Or at least that’s not what Radar told Trapper after getting off the phone with someone at Army HQ. Watch Hawkeye’s face during Trapper’s speech. He’s confused at first, then shocked, then a little disappointed for Trapper, then relieved that his best friend isn’t leaving. I wonder if the Alan Alda and Wayne Rogers and the rest of the cast thought about this episode after Rogers left M*A*S*H. If only more episodes had focused on Trapper, perhaps Rogers wouldn’t have walked away from the series. Margaret’s B story involving her weight worries is pointless filler. Hawkeye was actually pretty mean to her. I will admit that Frank talking to her about her weight is horrifyingly hilarious. The man doesn’t know anything about women but for some reason Margaret doesn’t get mad at him. The whole thing feels a little sexist. I wonder if there was a cut scene from the episode involving Klinger. His minor C story is filler as well but harmless filler. When he gets his physical you can see something under his right armpit. Later, when he rushes into the Swamp and announces his blood pressure is 200 over 310, Trapper asks if he’s stuffing cigars up his armpits again. Clearly, that’s a reference to the earlier scene but we didn’t see Klinger getting his blood pressure taken. Trapper is staying with the idiots at the 4077. Am I the only one who thinks Godzilla and the Bobbysoxer sounds like a really interesting movie? It’s also an anachronism. Godzilla wasn’t released in the United States until 1956, several years after the Korean War ended. While Margaret is giving her “cream of American military womanhood” speech, the shot of the nurses from the front doesn’t match the shot of the nurses from the back. Radar’s anchor tattoo must have been temporary. Him wanting to get a tattoo was revisited in “Images” in Season 6 and in that episode he didn’t have one (and did end up getting one that would wash off). This episode, “Kim”, “Bombed”, and “Ceasefire” are some of my favorites for the same reason: giving Trapper a chance in the spotlight. I love his character as he provides a much needed balance to Hawkeye. I have noted that Trapper came the closest of any of the surgeons in the series to treating Frank somewhat like a colleague rather than just a foil for their pranks. 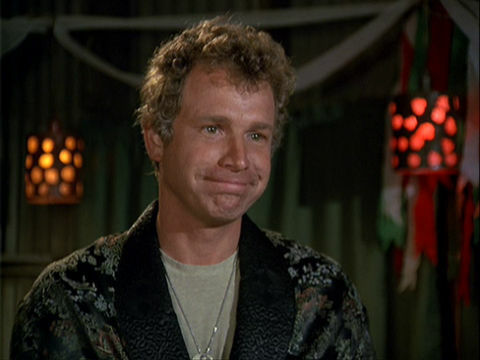 I would love to see an alternate universe M*A*S*H where Trapper and Henry were given equal footing to Hawkeye and see where the show would have gone in Seasons 4 and later with that balanced lineup. 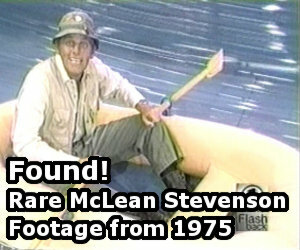 I always found Trapper much funnier than Hawkeye. Hawkeye was like Robin Williams – always “on”, always chattering, rarely letting anyone else have center stage, a constant barrage of quips and comments, most of which sounded scripted. Trapper had a dry wit which sounded natural and constantly cracked me up. Trapper, “I thought you were Frank’s bag”. MASH is a great show, but I think it would have been even better as more of an ensemble show, without Hawkeye dominating nearly every scene, every episode. I’ve brought it up before, but in retrospect, it seems like when Trapper actually did go home, having a proper farewell would not have been entirely necessary, mainly because he already got a big farewell bash in this episode: sure, he didn’t really go home then, but to throw him another farewell party would not have been practical for the show (I’m sure those off-screen antics Radar told Hawkeye about him being drunk for three days and running around camp naked were true). Margaret’s weight story rings true. I remember once my lady friend wore a dress that she thought made her look fat, but it didn’t at all. I don’t know what Hawk was talking about, but Margaret certainly wasn’t fat . . . in fact, if you look at later seasons, she looks painfully thin. All and all, this is a really good, solid episode; a great example of the chemistry Alan and Wayne had – they played real emotions, you can practically see the mist in their eyes in the aforementioned exchange in the Swamp. I saw this episode yesterday and I agree it was at times poignant and other times unbearable to watch. I’m surprised Margaret’s story line didn’t get resolved at all. Frank clearly knows nothing about talking to a woman because of his remarks to Margaret. The exchange between Hawkeye and Trapper seemed especially poignant given what would transpire at the start of the next season.